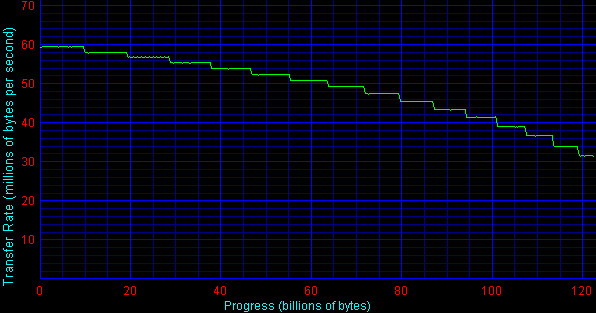 By the moment all hard drive makers have Parallel ATA drives with 8MB buffers in production. Today we will compare such drives (here you can find the comparison of the drives with the different buffer sizes). It's arguable if the buffer size directly influences performance because in some tests it even falls down), but the drive makers, being in a constant race for customer's wallet, keep on increasing different characteristics such as disc size, spindle speed, and now the buffer size as well. The situation around the spindle speeds is quite transparent - 5400 rpm drives are not produced anymore, while the time for 10,000rpm hasn't come yet. The only mine to develop is the drives of 7200 rpm. The disc size has reached already very high levels - it's quite difficult to fill up 200 or 250 GB drives if only you don't collect movies (though it's better to use CD-R or CD-RW media). In this case they have nothing to do but to improve other characteristics, for example, a buffer size. Today almost every manufacturer positions drives with a 8MB buffer as hi-end models. The only exception is WD that makes drives of 40 to 250GB both with 2MB and 8MB buffers. That is why the today's review can be considered as the review of Parallel ATA drives of the hi-end class as they are positioned by the drive makers. The models tested today are Maxtor 6Y120P0, 6Y160P0, Samsung 1614N, Seagate ST3120026A, WD 2500JB. 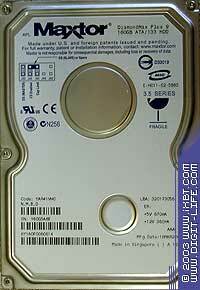 In the DiamondMax Plus 9 line the drives with the 8MB buffer can have the capacity of 80, 120, 160 or 200GB. 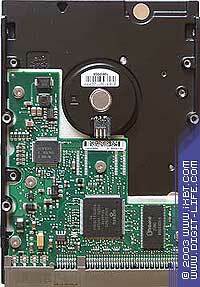 These drives are produced with the record density of 60 GB and 80 GB per platter. First we thought that the drives with the firmware version ending in "VWO" have 60GB, and those with the letters "BV0" have 80 GB per platter. 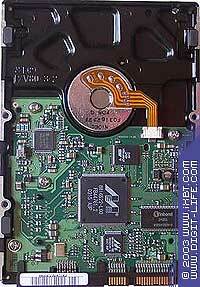 But then the company released a hybrid - the drives with the firmware version ending in "BV0" and 60GB platters. After long experiments our colleagues from F-Center found a new identification method - the second figure in the serial number indicates the number of heads. That is why we tested both drives. The both signs can be noticed here. Besides, it seems that the Maxtor DiamondMax Plus 9 drives check every sector once before recording for the first time, and this fact is nowhere mentioned! You can see it by interrupting the HDTach benchmarking and starting it anew. As this fact could affect the test scores, we recorded all drives of this line from the very beginning to the end before starting testing them. This hard drive belongs to the SpinPoint P80 line. The record density is 80 GB per platter. The drives with the 8MB buffer can be of 80, 120 and 160GB. 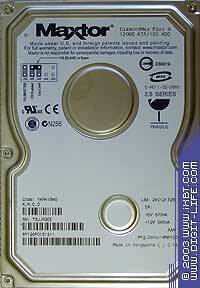 Note that Samsung is the only manufacturer that doesn't produce hard drives with three platters. The drive belongs to the Barracuda 7200.7 Plus line. 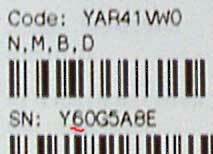 The ending of the serial number indicates the 8MB buffer. 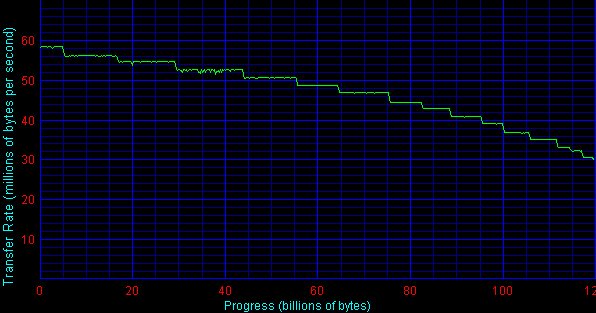 By the way, all other drive makers code the buffer size in the model number, not in the series number. 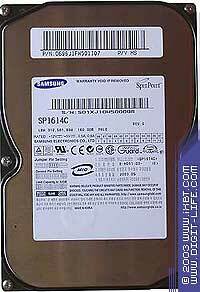 The drives with the 8MB buffer have the capacity of 120, 160 and 200GB. The record density is 80GB per platter. 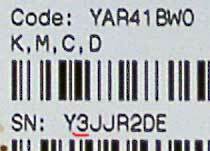 The drive was tested with the firmware version 3.05. This is the most sizable drive for today. Among all drive makers Western Digital and Hitachi Global Storage are the only who have already launched 250GB models. Besides, WD offers the longest drive line with the 8MB buffer: 40, 60, 80, 100, 120, 180, 200 è 250GB (no more companies make such drives with the capacity of 40 or 60GB). Here are the summary characteristics of the drives tested. The software suite is standard. 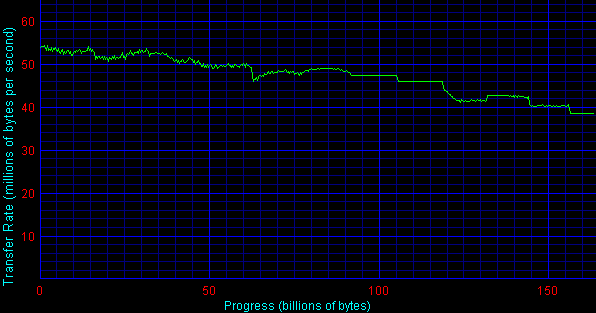 The Seagate Barracuda 7200.7 Plus falls into the last position. 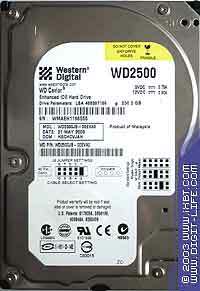 Its maximum read speed is lower even than that of the WD 2500JB of the lower record density. Lagging of the Maxtor 6Y160P0 was expected. The diagram of reading of the Maxtor 6Y160P0 looks odd - I've never seen such curves before :). Samsung's diagram looks so strange because of the BPI technology used (Bits per inch, linear recording density). The HDTach benchmark doesn't look trustworthy, and we won't use this benchmark anymore. 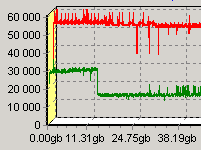 The Maxtor leads in the access time, while the Seagate falls behind the pack. In Ziff-Davis Disk WinMarks the first place is after the Maxtor. 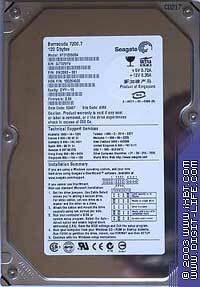 The Seagate Barracuda 7200.7 Plus finishes last, which is expected from the previous results. In case of light and average loads Samsung's drives are ahead, while the WD2500JB outscores them at heavy loads. Seagate Barracuda 7200.7 Plus falls behind its competitors. The gap in the Database pattern widens even more probably because there are more requests for writing. Maxtor's models keep in the middle, with the 6Y160P0 of the lower recording density showing better scores. 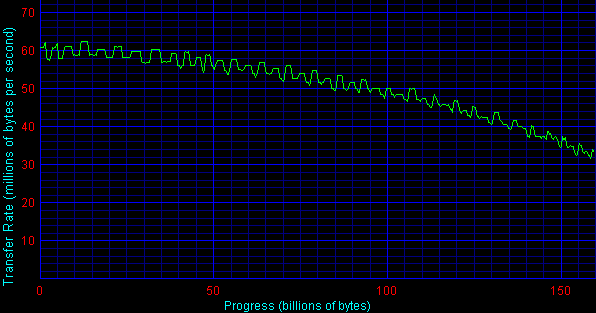 Well, the linear speed doesn't contribute much in the Intel IOMeter benchmark. In case of random writing the Maxtor 6Y120P0 unexpectedly runs far behind the 6Y160P0. The further test results are given only for the UATA/100 mode. The Seagate is the weakest in recording. The Maxtor 6Y120P0 doesn't shine either. Now come the serial modes. 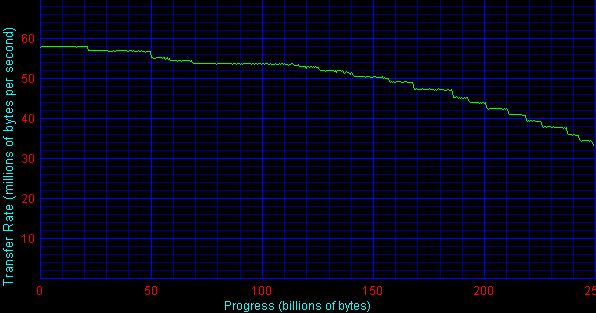 The drive gets requests for writing or reading of data blocks the size of which is gradually growing up. The queue depth is fixed at 4 (very light). Only the WD2500JB looks original. 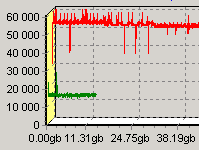 The WD2500JB, like the serial WD2500JD, doesn't like 1KB chunks. 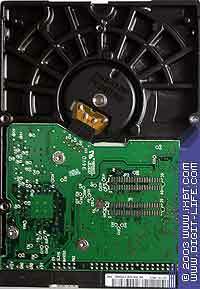 The quietest drive is Samsung SP1614C, with the WD2500JD being very close to it. The Seagate Barracuda 7200.7 produces a bit more noise, and it's also noisier than its predecessor. The Maxtor is the loudest among the 7200 RPM drives. If you need a sizable drive, you'd better take the WD2500JD which has the maximum size and blazing performance. The Samsung looks pretty good. The Maxtors are also good but not leading. The Seagate Barracuda 7200.7 has some performance problems, especially in write modes.